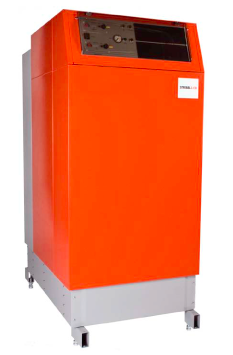 The floor standing Strebel SCB FS400 and FS550 boilers boast twin burner modulation technology, within one heat absorbing, triple multi-ring heat exchanger. The twin burners firing a single unit means exceptional modulation possibilities utilising the on-board logic sequencing program. Modulation to low fuel input levels, gives a higher absorbing surface area to input ratio, ensuring maximum efficiency and minimum pollution at all burning rates. Big in output, compact in size, the SCB FS Boiler measurements are surprisingly only 735mm wide, 1685 high, and 1095 long. The boiler is easily manoeuvrable having two in-built wheels making for easy access and positioning.